Get all of the deliciousness of a s’more without the mess with this S’mores Ice Cream Cake. Don’t get me wrong; every once in a while, one is ok, but overall I’d prefer something else. I mean can you blame me? Sticky marshmallows and chocolate with kids wielding sticks by a fire = a whole lot of issues. So I was thrilled when I found this recipe for S’mores Ice Cream Cake. It combines all of our favorites into one fantabulous dessert. 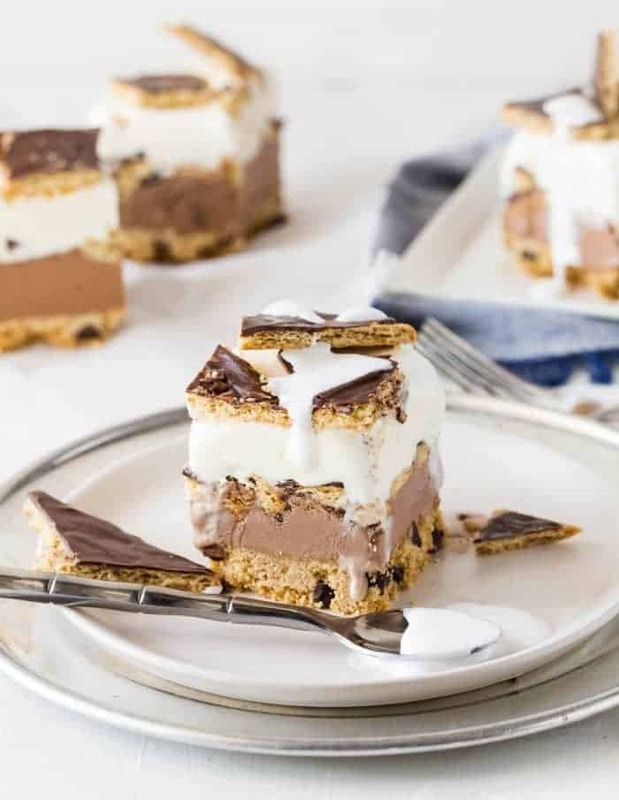 S’mores Ice Cream Cake takes the whole s’more dessert to another level. 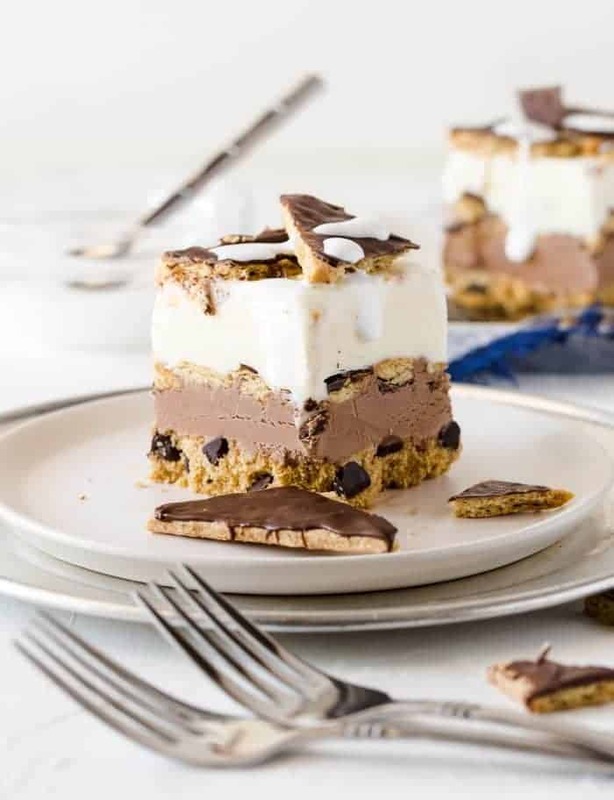 A graham cracker crust sprinkled with chocolate chips, layers of chocolate and vanilla ice cream, and chocolate covered graham crackers nestled in between and on top for an eye-catching, drool-worthy dessert. But wait, we aren’t done yet! Don’t forget the creamy marshmallow drizzled on top. As you can imagine, it took exactly 10 minutes for my family to devour this and wonder when seconds were available. So I guess I may need to rethink my relationship with s’mores because clearly there is something for everyone. Ice Cream, chocolate, graham crackers, and marshmallow. You cannot go wrong. And another bonus? It lets me sit by the fire without worrying about who is getting poked in the eye. All I need to do is field requests for who wants S’mores Ice Cream Cake. I’ll take that any night of the week. And another bonus? It lets me sit by the fire without worrying about who is getting poked in the eye. All I need to do is field requests for who wants S’mores Ice Cream Cake. I’ll take that any night of the week. Have you tried these precut parchment sheets? I use them all of the time when I am baking desserts to make lining the pan a snap! Line a 9-inch square pan with parchment paper, with parchment hanging over sides. Butter bottom of pan with 1 tablespoon melted butter and set aside. Combine graham cracker crumbs in a small bowl with sugar and add remaining 6 tablespoons butter and stir to moisten crumbs. Stir in chocolate chips and gently press crust in the bottom of the pan. Bake for 8 minutes and set aside to cool completely. Break 8 of the graham cracker halves into little pieces and cut the remaining in half, making triangles. Scoop the chocolate ice cream onto the crust and use a spatula to flatten and make a smooth surface. Sprinkle broken chocolate covered graham crackers on top of chocolate ice cream. Use the same process to spread the vanilla ice cream on top of the broken graham cracker crumbs. Press graham cracker triangles on top of vanilla ice cream. Cover tightly with plastic wrap and freeze for at least 5 hours. Heat marshmallow cream with 2 tablespoons of water in microwave until just melted (about 30 seconds). Stir until smooth. Grab the edges of the parchment paper and lift ice cream cake out of pan. Place cake on cutting board. Cut into squares and drizzle cake with sauce. 1) An easy way to soften ice cream is to place in the refrigerator for 20 minutes. Looking for more S’mores Sweets? Seriously, I am drooling Lisa! Thanks, Beth! It was fabulous and gone too quickly! Wow – pinning this one for hubbys birthday! Brilliant!! S’ mores without the mess! This is my kind of ice cream cake! It looks incredible! This looks delicious!! 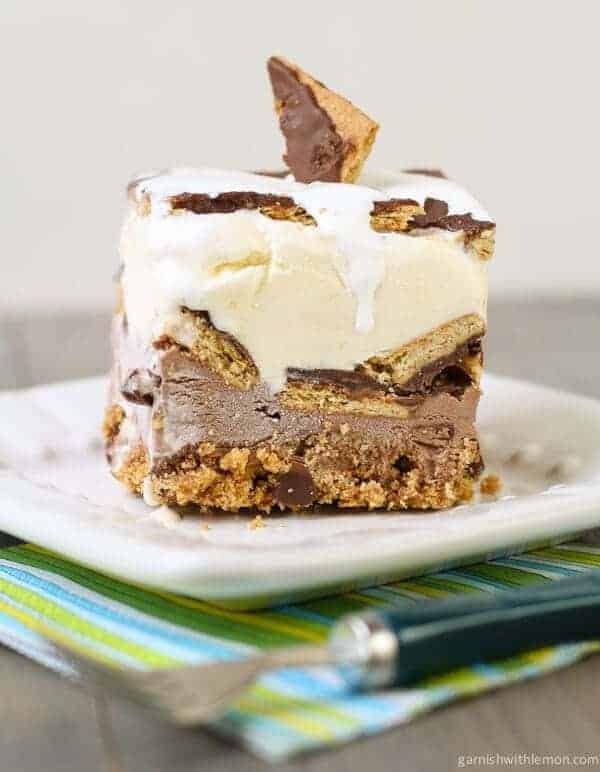 I love the idea of a s’mores ice cream cake! Thanks, Leah! It was delicious! Obsessed with this genius idea!